As much as the world likes to see the market as a rational and very efficient machine, one Yale economist strives to show us otherwise, in line with the British Economist John Maynard Keynes’ famous quote “The market remains irrational longer than you remain solvent”. The first edition of the book irrational exuberance was released at the perfect time – just when the dot com fever was at high pitch and this book, many claimed, really helped those who embraced technology to do business then. If it was useful for many back when the internet and modern communication and business techniques were just for nerds, how much do you think it will help you if you read it now? 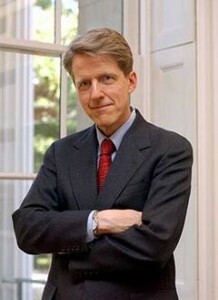 The author, Robert James “Bob” Shiller is not only a renowned American economist but also a best-selling author and an academic who studied and has served in Yale University, Yale School of Management and the Yale International Center for Finance. He has also been a research associate at the National Bureau of Economic Research, president of Eastern Economic Association and Vice President of the American Economic Association in back 2005. 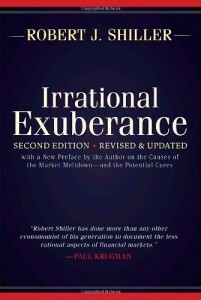 Besides Irrational Exuberance, Robert has also written a number of investment books including ‘Animal Spirits: How Human Psychology Drives the Economy, and Why It Matters for Global Capitalism’ with George A. Akerlof, ‘The Subprime Solution: How Today’s Global Financial Crisis Happened’, and ‘What to Do about It, Finance and the Good Society and The New Financial Order: Risk in the 21st Century’ just to name the most popular. The first edition of Irrational Exuberance was such a huge success because it offered a wide range of historical evidence and published research in the context of the stock market and how it relates with the market of today. Although it seems to have no specific focus point, the book brings forth concrete suggestions on the policy changes that are already in place and those that must be made in response to market conditions. 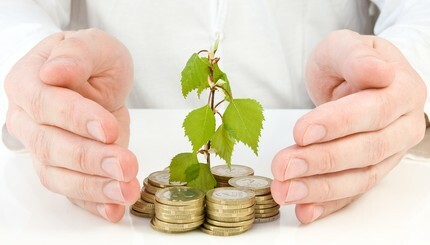 The book argues that an economic boom such as that of the stock market boom of between 1982 and 1995 is speculative and not based on any sensible economic fundamentals, hence considering its structural factors will enable you to see such an opportunity from a distance, and benefit from it even before everyone else realizes. This book introduces 12 essential factors that are the ultimate causes of an economic boom including naturally occurring Ponzi processes, Amplification mechanisms that amplify the effects of precipitating factors, cultural factors and the effects of the market by the news media and the ‘new era’ of thinking. The book further discusses psychological factors of the masses, psychological anchors in the market and the ‘herd’ behavior. The book is subdivided into five parts, but of greater interest is the fifth part which tries to rationalize exuberance and teach efficient markets theory among other theories that investors like you are learning. In this book, Robert believes that the market is grossly overvalued and the baby boom effect, media interest and the public infatuation with the internet all conspired to amplify the baby boom effect. It is definitely worth checking it out.